Model Train Track Codes - Going for Realism! Various sizes, or codes of model train track are available for each scale. The codes are written as numbers, which correlate to the height of the rail in thousandths of an inch. In the prototype world, the heavier rails are used for mainlines and the lighter rails for spurs and branches. If you model with code 100 for the mainline, you could realistically use code 83 for passing sidings and spurs. If you use code 83 for the mainline, you would most likely use code 70 for the branch lines and passing sidings, and perhaps go down to code 55 for small spurs. The roadbed for these codes differs as well. In the real world, railroad companies usually spent more on installing and maintaining mainlines than they did on smaller branch lines and spurs. As a result, the spurs usually have little or no roadbed, and there are usually lots of weeds growing around and in between the rails. The space between ties also varies with the different codes. Main lines require 24 ties per 39-foot rail, which comes out to 11 ½ inches between the edges of each tie. For spurs, the spacing is more like 16 inches between tie edges. With this in mind, when you lay your model train track for the mainline, use the regular scale roadbed and the standard tie spacing that is made to scale by the manufacturer. However, when you’re putting in sidings or spurs, use a smaller code rail, cut the plastic connections on the bottom of the rails with a sprue cutter, and pull apart the ties a few scale inches. This will provide a more prototypical appearance for your railroad. 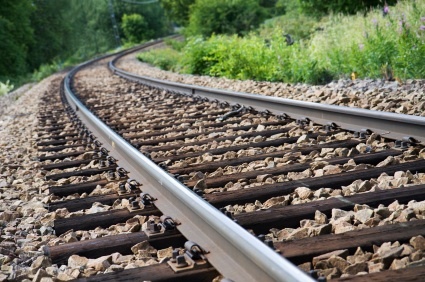 Also, for some small industrial spurs, you may want to place weeds and dried or oily grass around the tracks, scattered cinders, and show that some of the ties have become crooked and not well maintained. Wooden or cement bumpers at the end of the spurs may look heavily weathered and “beaten-up” as well. Track weathering for your model railroad track may also reflect poorer care on the sidings and spurs with more rust on those rails than on the mainline and the ties will usually be more gray or gray-brown, whereas the mainline ties will be more black or dark-brown in color. There will be little or no ballast on the smaller spurs, perhaps a little on the passing sidings but more likely cinders will be used there, whereas the mainlines will have regular ballast “purchased” from local quarries. Prototype railroads used granite for ballast whenever possible, otherwise limestone. If you consider these details as you lay your model railroad track, you will end up with a very realistic and obviously well thought out railroad, which will go along way to emulating the real thing. From "Model Train Track Codes" to "Laying Model Railroad Track"
From " Model Train Track Codes" to "Homepage"